A quick little bit of clapping-Me and my Your Day Gift Card Holder got picked over at Stampin' Royalty as one of the Top 3 Goddesses of the Week. They have gotten their new challenge blog off to a great start, so it is an honor to be chosen amongst so much talent. Thanks girls. "Just Us Girls" Challenge is template time. Lauren Meador from My Time Made Easy sponsors the template challenges. She has got some really cute templates, I've just not ordered one yet. Then, surprise at Touch of Creation, Piali created this cute carrot template to share. I added some faux stitching and a touch of green for The Pink Elephant Challenge and Wah Lah, I've got a cute carrot ready to fill with jelly beans for a Bubbles and Bunny Party. "Just Us Girls" Challenge JUGS22-Template Time! Supplies: Template-Created by Piali, Papers: Sunburn double sided paper pad, Stamp: Stampin Up-Eggcoutrements, Ink: VersaMark Ink Pad, CTMH-hollyhock, Ranger Inkessentials White gel pen, Stampin Up- clear embossing powder, fibers-EK Success Adornaments, ribbon-Offray. 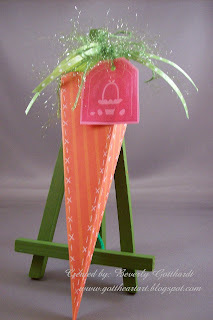 what an adorable carrot and such a cute idea for candy for co-workers or grandkids! WOW!!! You made it much prettier.. Love it. How adorable! I love this carrot template. SO perfect for upcoming easter events. Thanks so much for playing with Just Us Girls! What a fun & out of the box creation! This carrot is awesome! Thanks so much for playing along with Just Us Girls template challenge! Hope to see you on Saturday for an all new challenge! Ah Beverly - this is just adorable - what a timely and cute template - I've seen people use pastry bags as carrots but this is way cuter - love the faux stitching too. Thanks so much for playing along with Just Us Girls this week. We appreciate your participation and support. :-) Hope to see you again on Saturday! What a great little make Bev. Love it and fabby stitching. Hope your well. fab, fab, fabulousness! thank you for sharing it with us at the pink elephant. This is just gorgeous and it would make a great Rudolf carrot too. LOve it.